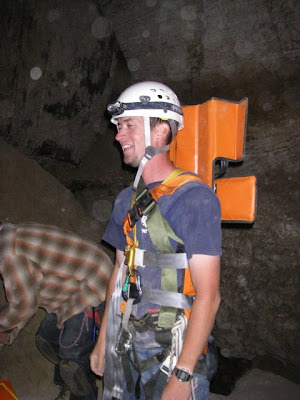 There's a lot of publicity for the upcoming PBS Series The National Parks: America's Best Idea. Some of that publicity is spilling over to local parks. 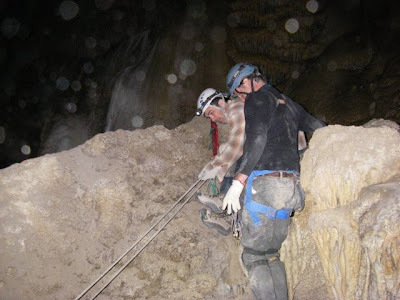 Here are some reports from KNPB from Reno about Great Basin National Park, one of our favorite hangouts. 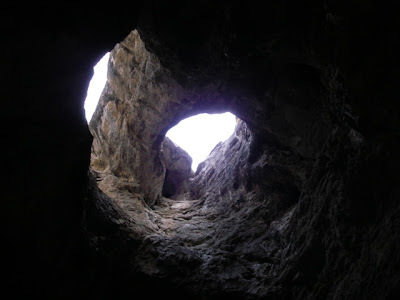 It also happens to be one of the least visited national parks. 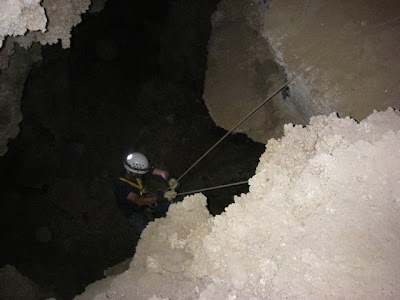 Great Basin National Park is home to Lehman Cave and 41 other caves, ancient bristlecone pines that started growing before the pyramids were built, a rock-glacier that manages to preserve ice under a thick blanket of rock, beautiful sub-alpine lakes, and virtually empty backcountry trails. 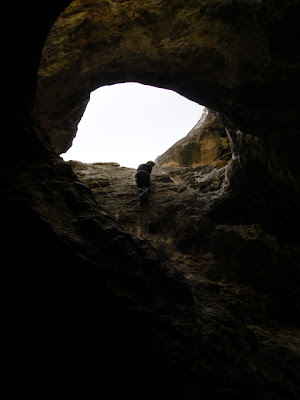 It's a good place to get away from the noise of every day and look up at the really dark night skies and ponder your place in the world. The reports were produced by Michael Hagerty, who happened to go to elementary school in the same town I grew up in. We both sure ended up far from our roots! 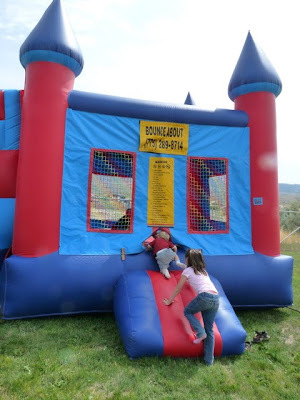 If you missed The County Fair-Part One, click here. 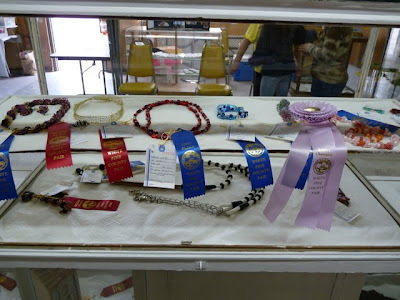 The White Pine County Fair has one exhibit hall, and when it opened its doors Saturday morning, it was full of people going in to see how their entries had done. Of course I was no exception. 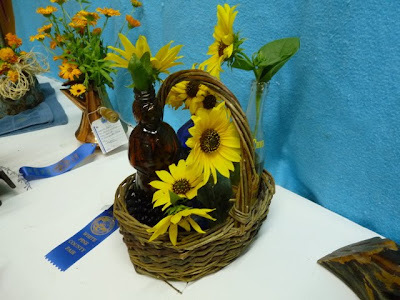 Here's a flower arrangement I did with the theme of old bottles. We had no shortage around the ranch, and I figured with the interesting bottles I could keep the flowers simple. I really enjoyed looking at all the talent on display. 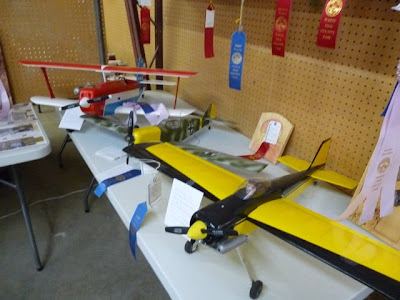 These model airplanes were quite impressive. I've never tried making jewelry, but some folks who did had good results. 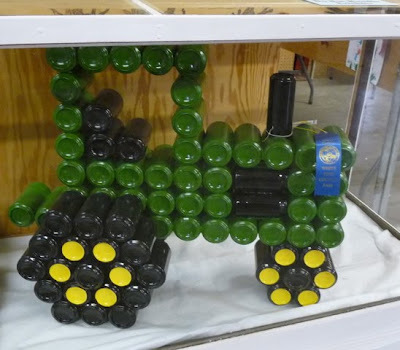 I thought this was a clever idea--a tractor made out of painted soda cans. The crops section had lots of entries. It looked like many people are having good gardens this year. 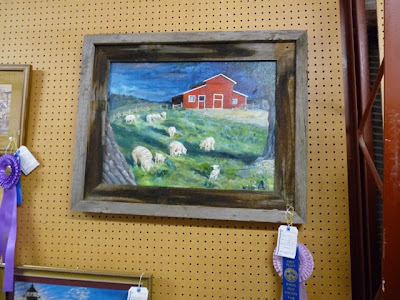 A friend did this beautiful painting of a barn near her house and won reserve grand champion. I could have spent a lot more time looking at all the exhibits. The handicrafts section with gorgeous quilts and afghans is always amazing--and a little intimidating. I don't think I would have the patience to be so exact. There were fewer baked goods than some years, but I saw that quite a few people were salivating over the donuts. 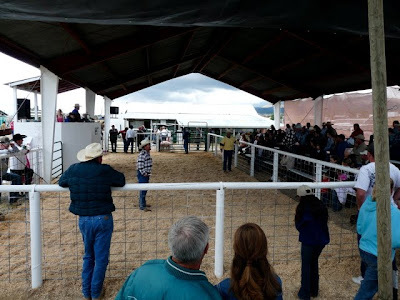 On Sunday morning, the 4-H auction was held. For some kids, it's very difficult to part with the animal they've spent all summer caring for. 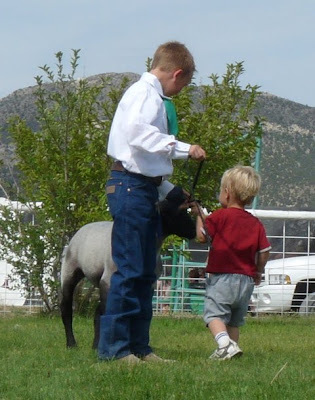 For other kids, they don't have as much trouble, knowing that their animal is going to help them pay for their future college education. 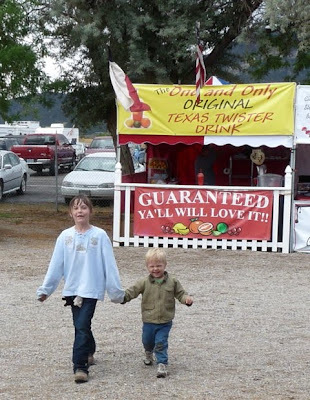 At the other end of the fairgrounds, an assortment of booths was set up, including the favorite classic "Texas Twister Drink," a sweetened drink with some fruit. After seeing so much deep fried food at other fairs, it's quite refreshing to see some healthier options! If you look closely at this photo, you'll notice something has changed--the clothing! Sunday morning brought much cooler temperatures and scattered rainstorms. 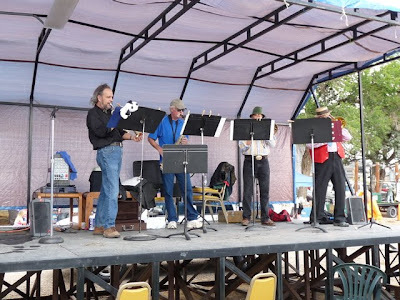 Entertainment played on a tarp-covered stage and included musical numbers, cowboy poetry, magic shows, and more. 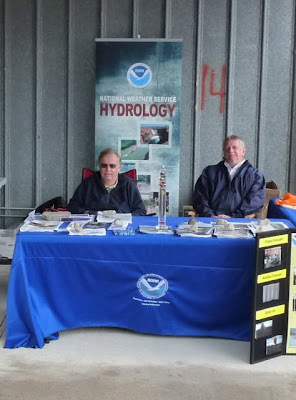 Along with booths selling things, there were also informational booths, like this NOAA one that gave out information about weather and asked people to report strange weather events near their houses. 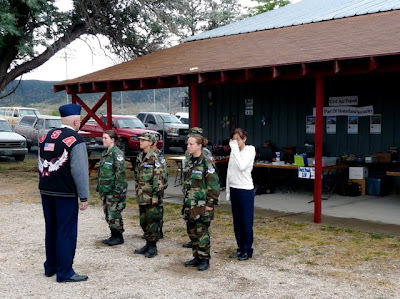 The Civil Air Patrol had a duck pond and fishing pond that Desert Boy liked. They also did some drills in the morning. 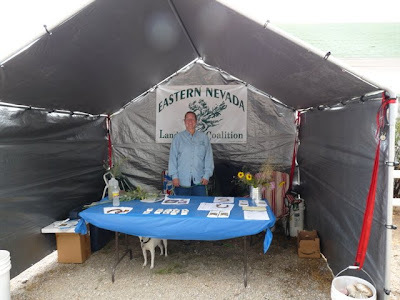 Here's Betsy MacFarlan, Executive Director of the Eastern Nevada Landscape Coalition, a group who works to restore Great Basin landscapes. I sat at this booth for awhile and handed out free weed books, newsletters, and weed tattoos. It was fun seeing the fair from a different perspective--and when it rained, it was nice to be under cover! It was fun visiting the fair. Congratulations to all the participants and organizers for a job well done! And thanks to the buyers, spectators, and everyone else involved for attending. 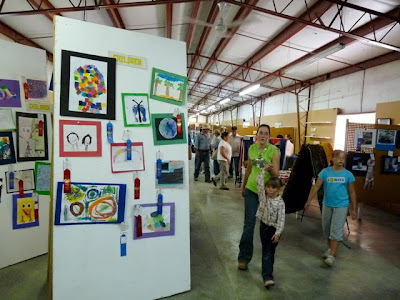 A fair is a great way to see what a community is like. Saturday morning we headed into Ely for the White Pine County Fair, where we saw Cousin Clay leading his steer in preparation to show it. 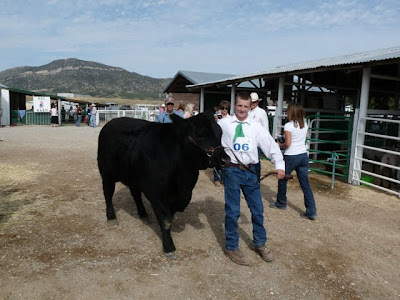 He had been preparing all summer for this weekend by feeding, walking, and taming his steer so that he didn't have to worry about a nearly 1,500 pound beast walking all over him. 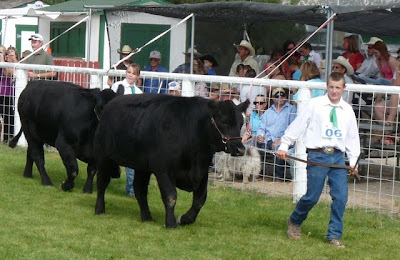 He was soon in the show arena with six other steers. They walked them around in circles so the judge could inspect them, then lined them up one way and then another way. I was very surprised to find that only seven steers had been entered in the fair. 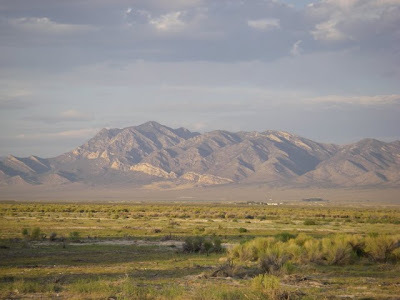 My husband explained that there aren't as many ranches anymore. 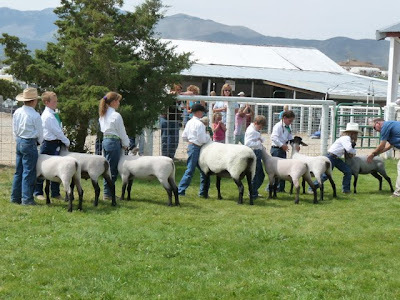 That's certainly true--Southern Nevada Water Authority bought nearly all the ranches in Spring Valley in the last few years, taking away the opportunity of many young kids to get experience with farm animals and showmanship. It's one of the many unintended consequences of a huge water grab. 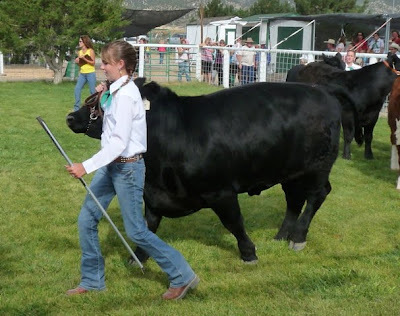 Cousin Alyshia had better control of her steer than she did just a few weeks ago. She obviously made good progress, and all her hours with the steer paid off. It might have helped slightly that Alyshia's steer followed Clay's around and around. They already knew each other and felt comfortable. The steers didn't bat an eye when they passed the bleachers, which were filled with spectators. Although the morning started off cool, the temperatures soon escalated into the high 90s. It made it much more of a challenge to stay cool and calm, but Alyshia managed to get a Reserve Grand Champion for showmanship. Way to go, Alyshia! 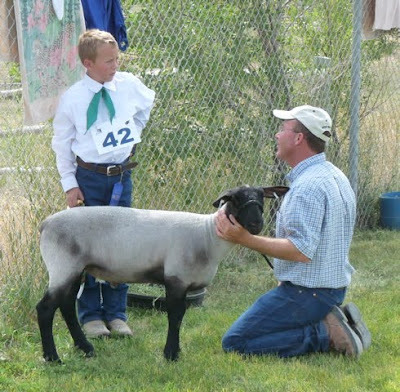 Meanwhile, Cousin Caleb was getting some words of advice from his dad for showing his lamb, Tony. Desert Boy liked petting Tony's soft wool. Then Caleb let Desert Boy help walk Tony around. 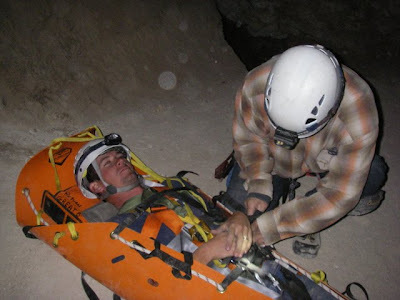 Desert Boy was enthralled with the experience. 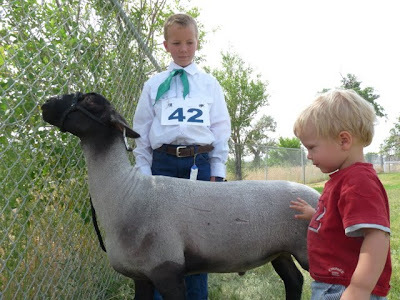 It won't be all that long until Desert Boy has his own sheep. I suppose I should try to learn a thing or two about sheep before then. At this point I think my knowledge would fill a thimble. Although there was just one class of steers, there were many more sheep entries. They were divided into juniors, intermediates, and seniors. 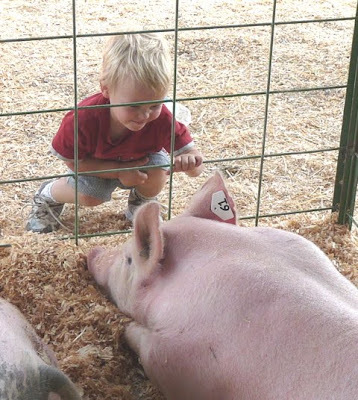 The pigs were shown in a separate arena. We didn't get a chance to watch them there, but we did visit them in their barn. 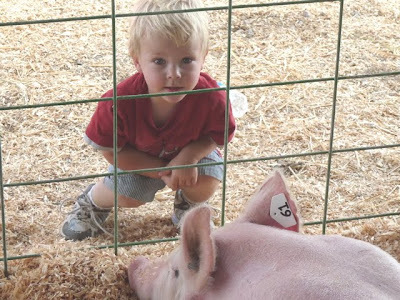 I love looking at the pigs. Apparently so did Desert Boy and Cousin Kayli. 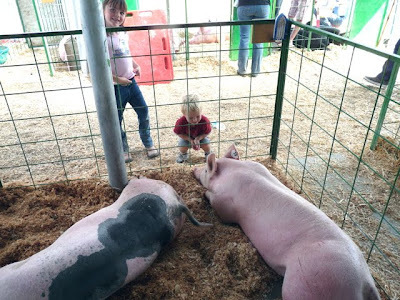 Hey, look Mama, I'm right next to a big ole' pig! I think Desert Boy would have brought that pig home with him if I had let him. 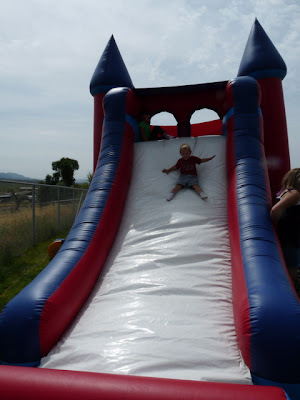 and went down the big slide! They had a great time and ended up all sweaty with big smiles. I'm out of energy today, but tomorrow there will be more about the exhibit halls, auction, and booths. Although the White Pine County fair is small, it was fun! We had record high temperatures today, and the lines at the fair were long. To make matters worse, Desert Boy decided it would be really fun to throw some temper tantrums. So the peppers never got entered, but the other things did. I didn't manage to take any photos today, but hopefully I will this weekend. And fortunately by Sunday the high is supposed to be 80. I am ready for some cool temperatures. Fair weekend is always miserably hot--at least in my experience, although my husband remembers some freezing temperatures when he used to participate. What did you enter in the fair? Or what would you like to enter next year? This year I've had a wonderful garden. I'd like to take the credit for it, but I think the good weather is mostly to credit. It's my first year to plant sweet corn, and let me tell you, it is such a treat! I love to go pick a couple ears just before dinner. 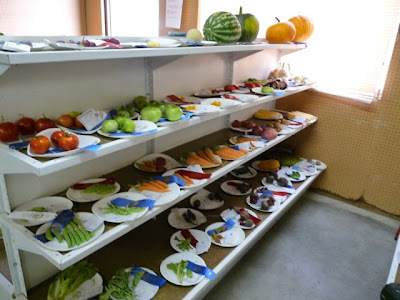 We also have eaten zucchini, broccoli, tomatoes, green beans, beets, carrots, peas, spinach, and lettuce. We're still waiting for the brussel sprouts, cabbages, melons, and bigger tomatoes. It's so fun to go out and harvest. 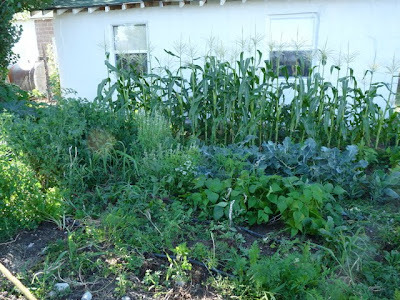 I am also really good at growing weeds, and am thinking about doing a theme week of Weeds of My Garden for my A Plant a Day blog. It's sad but true I really do have a week's worth of material. Here's one evening's bountiful supply. 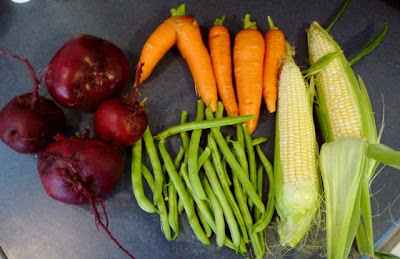 (We still need to eat the red beets--they are so big we can only eat one a night!) I sort of feel like a pioneer, eating off the land. It sure would be a lot of work to grow enough to last a year like the pioneers tried to do. 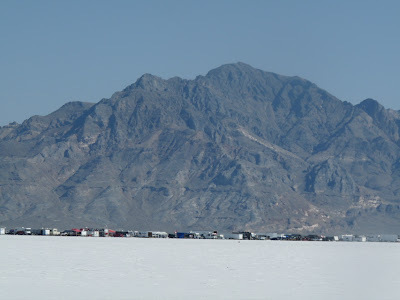 In case you missed the first installment, click here to see Bonneville Speed Week-Part One. 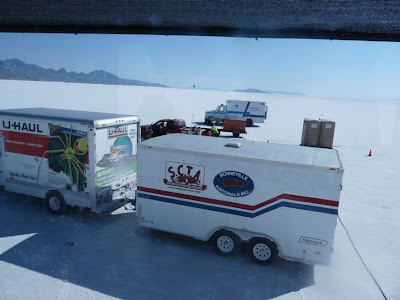 After watching so many neat cars and motorcycles go zooming away across that smooth salt trying to go as fast as possible, trying to break the record for their class, it was our turn to go out on the salt. No, we weren't racing (although I'm sure my husband had several thoughts about it). Instead, we had permission to go visit the main timing tower, which is located between the long and short course at mile marker three. 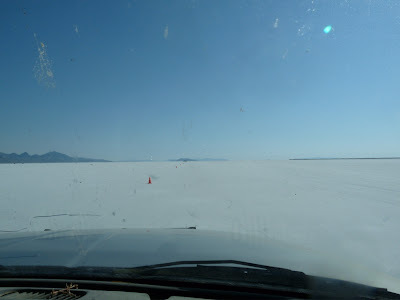 It was neat driving out on the salt and have vehicles zooming past us at much faster speeds. James Rice was waiting for us. 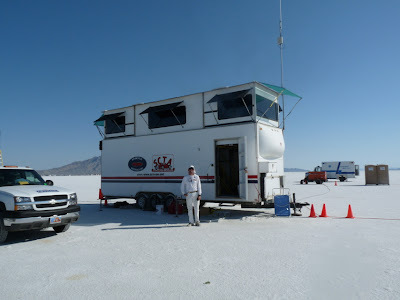 I had met James at a caving event, and we had started talking about Bonneville Salt Flats and Speed Week, and it just so happened that James is in charge of timing the vehicles! 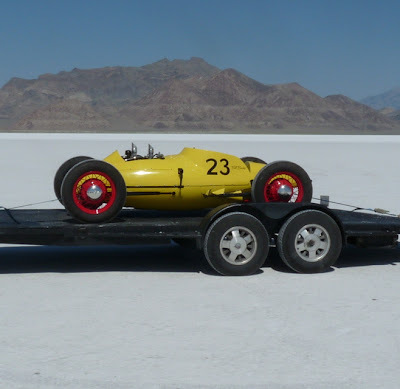 He and his brother Alan run the company ChronoLogic Timing, which does the timing for both Speed Week and World Finals at Bonneville, along with an assortment of other meets. 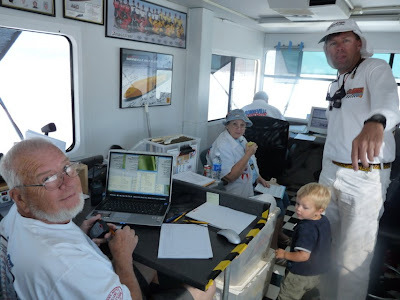 We went upstairs in the air-conditioned control tower to meet some of the folks helping out. 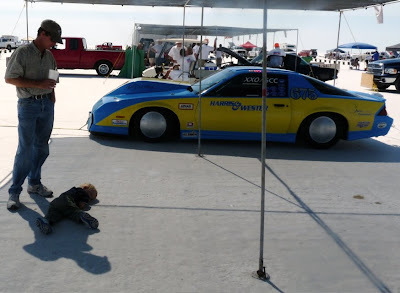 Glen Barrett, on the left, has been involved with Speed Week for decades, and his daughter, Tammy (not pictured), is following in his footsteps. 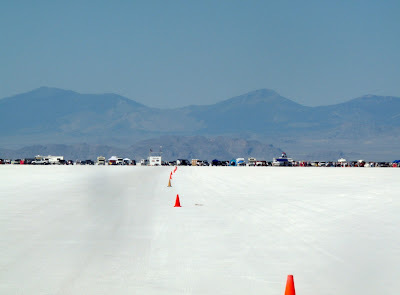 Speed Week becomes a tradition with many people, and not just the racers. The starters, timers, patrollers, inspectors, and others who help with the race go back year after year. Tammy said that when people ask where she's going, she says, "To my family reunion." 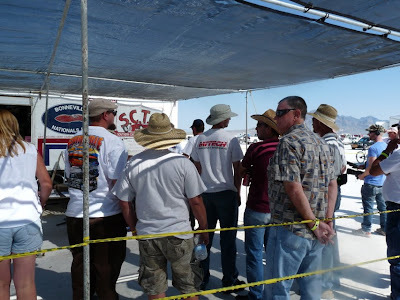 The Southern California Timing Association (SCTA), which sponsors Speed Week and other races, is an all volunteer organization. Obviously these folks love what they're doing. 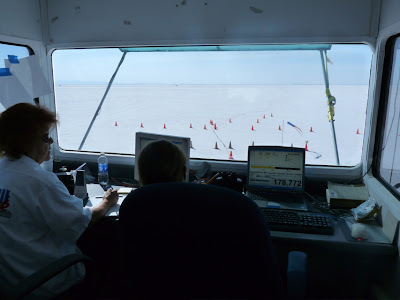 On each end of the control tower are a pair of workstations that overlook the race course. The computers show the times of the vehicles as they pass the sensors. Everything is recorded, and it's known in just a few seconds if a record has been broken. To the back of the timing tower are more support vehicles, along with emergency vehicles like a fire truck and an ambulance. Although not usually necessary, they are essential. Unfortunately there was one fatality at Speed Week this year. Downstairs, James showed me the supply of extra timing mechanisms. These occasionally get run over (he had cleaned one up earlier in the day), so they always take several spares. They also have a large bank of radios to keep everyone in contact. With such long race courses, good communications are essential. 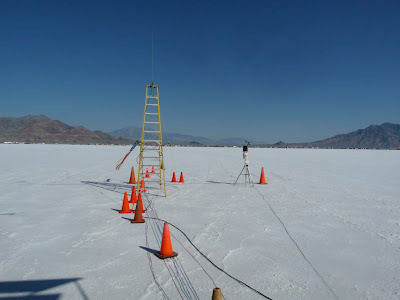 The timing devices are hooked by hard line into the timing tower. 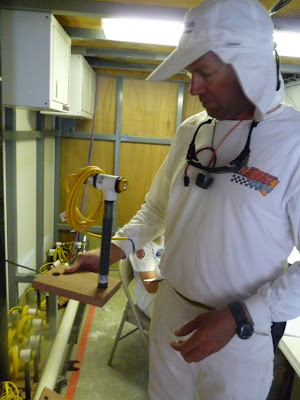 From there, the results can be broadcast wirelessly for a short distance, and are uploaded onto the SCTA website each night. Thanks so much, James, for giving us this peek into the behind-the-scenes action at Speed Week! It is really amazing how many people are needed to make an event successful. This is the view looking from the timing tower towards the pits, which are near the end of the long course. 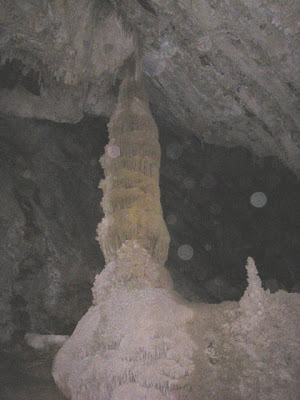 The salt has interesting patterns on it from evaporation. 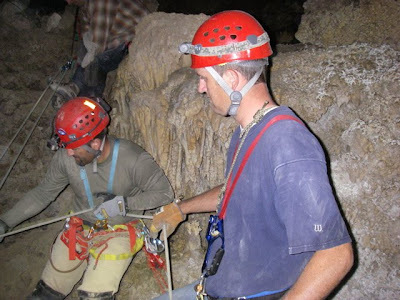 There's a group called "Save the Salt" that works with the BLM and a nearby mining company to try to preserve the Bonneville salt. We drove back to mile 0, staying close to the orange cones so we didn't disrupt any of the racers. Then it was time to head out towards the pits, where we also found the registration and inspection area. 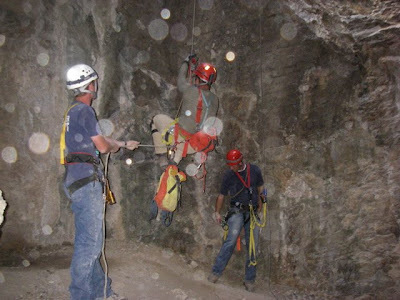 Safety is taken very seriously, with three inspectors closely checking each vehicle. 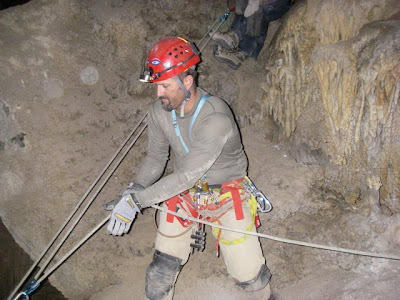 The drivers have to be familiar with the required safety gear and how to use it. New drivers also have to attend an orientation. We were surprised that there were still new drivers signing up on Wednesday. They still had the rest of Wednesday and Thursday and Friday to race. The busiest race days are usually Saturday through Monday, and then as people reach the times they want or their vehicles reach their limits (or they have to go back to work), they head home. Desert Boy was worn out from all the looking around and laid down on the salt. 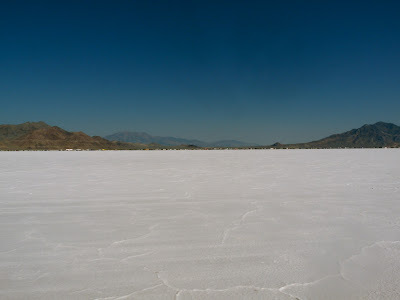 We lucked out with weather--when we got to the salt flats it was only about 65 F. In a few hours it warmed up to 85 F, and was expected to get slightly warmer. 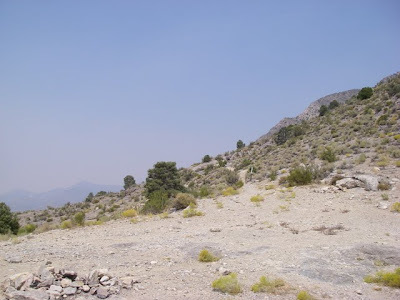 One official told us that some years it can be up to 110 F, and then it's just brutal. I can only imagine. There is so much to see at Speed Week that these blog posts just give a hint of what's out there. It's a fascinating world of speed, machinery, and camaraderie. I encourage you to go see it for yourself, it's not like anything else I had ever experienced. What's next? My husband and the ranch mechanic are already hatching plans for what farm equipment they can resurrect and supercharge to set new land speed records. Fortunately, tractors aren't one of the racing classes, so maybe we'll be okay!